Luxury spacious Villa surrounded by greenery is a great place to stay and have amazing vacation experience. The stunning Villa is located in the heart of a Golf club near the ocean. Book and enjoy your perfect tropical vacation. You will feel right at home in this cozy living room with premium wooden furniture. Enjoy this nice view from the balcony. There are two swimming pools for adults and children. Relax in a cute bedroom with a king size bed, cable TV and floor-to-ceiling windows. Comfort, sunlight and a lot of fresh air. Charming bedroom for two. You will love this floral design and soft colors. Very quiet area with lots of greenery. Here you can relax body and soul. Fully equipped spacious Villa, each room has air conditioning. The surrounding area of the villa Cueva. Take a walk and see how beautiful this area is. You can lie by the pool and sunbathe on the comfortable sun lounger. Another cozy bedroom with 2 beds and a flat-screen TV. Sliding doors lead to the patio where you can relax. All bedrooms are cozy, clean linens and towels are provided. There is a lot of natural light and beautiful views. Flower design, cozy, soft atmosphere will make your stay super comfortable. It is a dining area with a large table. Gather here all together and enjoy a delicious breakfast or dinner. The bedrooms have all the necessary amenities. The beds are super comfortable and will ensure a good healthy sleep. The Villa is located in the heart of the Golf paradise. It does not take much time to get to the beach, just a few minutes walk. Very nice details of the interior will make you feel right at home. Private bathroom. Relax after a long day, fresh towels and basic essentials are provided. It is a really spacious Villa that can accommodate a large group. Great choice for family or friends. You will have a lovely patio with home plants. Very nice area to relax. Come here and enjoy your stay. Don't miss unique opportunity to rent this really spacious fully-equipped 6-bedroom villa. Enjoy cooking in this kitchen. It is fully equipped with modern furniture and kitchen appliances: fridge, oven, stove, microwave, coffee-maker, water cooler. A blender and coffee maker will help you make delicious breakfast. Feel special while staying in this Villa. All the bedrooms provide comfortable accommodation. Enjoy your stay here. YOU can see that all the rooms are very well-equipped. This spacious bedroom has a big wardrobe, air conditioner, nightstands with lamps, cozy armchair. Book it now! A small room for a housemaid. Spacious bedroom with a big wardrobe, air conditioner and nice curtains. Functional clean bathroom, we provide a set of fresh towels for each guest. As you can see, there is a lot of storage space, use a huge wardrobe and a dresser. We pay much attention to the comfort of our guests. You don't have to carry a lot of things (soap, towels, shampoo, etc). We've already taken care of everything. Wide hallway, all the rooms are very bright and full of sunlight. Gain strength for new exciting adventures in Punta Cana. Soft beds with clean linens, air conditioning and plenty of storage space will make your stay pleasant and comfortable. Take a hot bath in your private bathroom. Rest after a long day and go to bed. Start the day in your private bathroom with a large mirror! It is an ideal place for those who are looking for comfort and privacy. Your comfort is our priority. Your clean private bathroom with bath and shower. This villa has everything for a comfortable stay. Fantastic patio where you can dine outdoors with your family and friends. Great place to enjoy the fresh air and pool view. You will love spending evenings outdoors. Very green area, amazing Golf courses near your Villa! You can swim and sunbathe by the pools. The pools are clean and well maintained. Don't miss your chance to play golf on one of the best golf courses in the Dominican Republic! The common areas of the residence are very comfortable and look amazing. Unique green area. Take a walk and enjoy the wonderful Dominican tropical nature. The whole family can relax by the pool. Your kids can have fun in the small pool, it is safe. You can enjoy a cocktail in the bar while relaxing by the pool. Book our Villa and get your dream vacation! A great choice for a large group accommodation. Relax in the patio with lots of green plants. Enjoy the relaxing atmosphere of this place. View of the Golf course. You can take Golf lessons at an additional cost. You will appreciate this relaxing and peaceful atmosphere. The nature here is very beautiful. Come to stay here if you are looking for tranquility and wonderful views. There is a beautiful pond nearby. Just walk and enjoy this charming environment. You can quickly get to Palma Real Shopping Mall. It is the most exclusive shopping mall and entertainment center in the Dominican Republic with high-end stores and restaurants. Aerial view of the area. Enjoy this private oasis at the center of all activities. Improve your golf skills on the best course and enjoy the surrounding nature. Stunning scenery and untouched tropical nature surround your Villa. A tennis court is located next to the pool. If you get tired of sunbathing and swimming, play tennis. You can sunbathe by the huge club pool, sip a drink or take a nap under the parasols. Have sports activities during your stay here! Take Golf lessons or play tennis and volleyball. 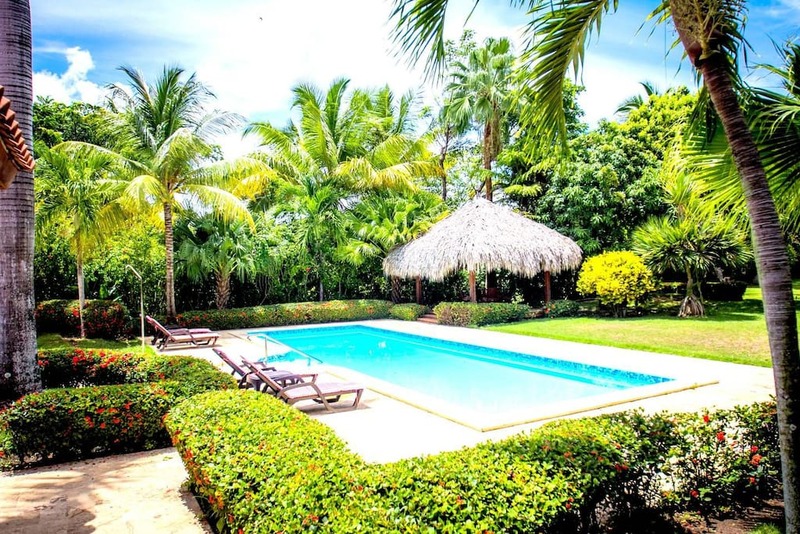 Enjoy your stay at this Punta Cana villa with a huge swimming pool, near the beaches, shops and restaurants. It is a completely safe residence with 24/7 security. Don't worry, this is one of the most prestigious areas of Punta Cana. Book your vacation at this brilliant Punta Cana villa, located right at Cocotal Golf Club. It is a very safe and well-secured place. The residence has everything you need for a great holiday. Large swimming pool with bar, sun loungers and a stunning peaceful atmosphere. Aerial view of the Golf course. You'll have a unique opportunity to explore this place and improve your golf skills. Admire the beauty of the nature of this place. Your Villa is in the heart of the Golf club. Come here for the most beautiful views and unity with nature. Then this super-spacious 6-bedroom villa with a patio and a lounge area, located in a quiet environment of world famous Cocotal Golf & Country Club is for you. Is an elite gated community with a restricted access, ensuring absolute privacy and security, so you can have a rest and don’t worry about anything! Villa Cueva… it’s the unique and full equipped, totally private and comfortable for different travelers mansion. Feel the luxury! This Villa offers all the comforts of being at home. TVs are in each bedroom, air conditioners (or enjoy the evening fresh air), in-suite bathrooms, cedar-lined large closets, large private backyard, large pool and hot tub. There is no other house like this with a private cave in the area. Go exploring, have a picnic — the cave is lighted. !!! > 7,500 sq. feet under roof and private garage. Expansive underground cave — have to see it believe it! Everything you might need – just send me a message in AirBnB or contact with your personal assistant. 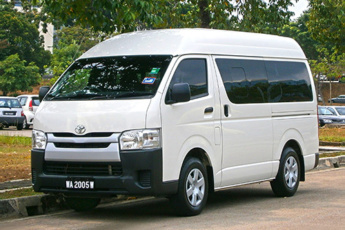 We organize any kind of events, excursions, transportation and activities! This is the most secure place in the area. With access to gated community and a private beach so you can totally enjoy your stay. This lovely unique residence is located right in the center of the famous golf club of Cocotal with its amazing views. Where else can you combine your vacation with advancing your golf skills or taking a couple of lessons? Moreover, in the club you will find everything that is needed: a mini-market, fitness studio, and a restaurant. If you decide to take a break from you training or enjoying the game, you can bask in the sun for a while at the amazing white sand Bavaro beach not far away from the residence. Enjoy yourself and try various activities like scuba diving and snorkelling, have a meal in a good company in international cuisine restaurants or a refreshing drink in numerous bars, go shopping, visit sport or massage centers. We purposefully went to Punta Cana to play golf. The villa has a wonderful location - right on the territory of the Cocotal golf club and residence. 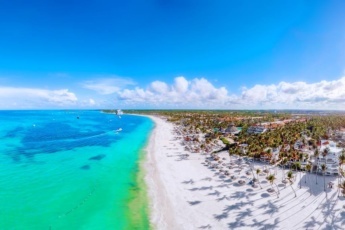 This is probably the safest area in Punta Cana and one of the greenest. The villa is huge, we liked everything here absolutely. And the most important thing is that you have a personal assistant who consults where the nearest shops and restaurants are and advise places to visit in the country. Guys, thank you for the excellent service! We were very happy with the home and all its features. Our family enjoyed the pool, grilling outside, and the swing in the backyard (which provided hours of entertainment for the kids). The house was clean and spacious. Thank you for opening up your home to us. 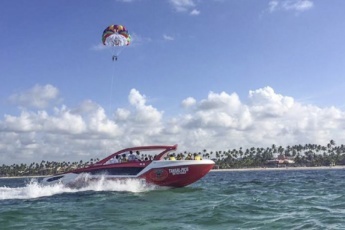 We will recommend your home to family and friends visiting the Punta Cana area. Where can I play golf in Punta Cana? One of the most famous places to play golf in Punta Cana is Cocotal Golf & Country Club. Reserve our Punta Cana villa Cueva with a direct booking punta cana and enjoy your stay at Cocotal Golf Club. Punta Cana isn't safe at all. But our Punta Cana property is absolutely secure. The whole community is gated and protected by 24/7 on-site security, thus your stay will be safe and secure. You will also have a secure parking. I am looking for a golf holiday to Punta Cana. 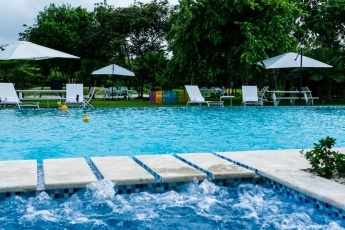 Our vacation rental Punta Cana Cueva, located at the famous Cocotal Golf & Country Club will be the best option for you. Enjoy your stay playing golf and vacationing in Punta Cana! Book your holiday to Punta Cana right now with a direct booking Punta Cana without any commission fee. 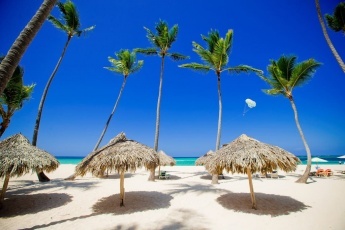 What is the current weather in Punta Cana? 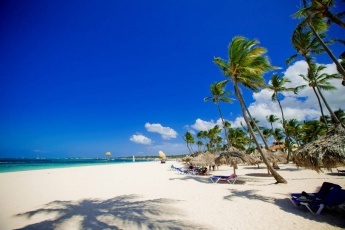 The average weather in Punta Cana is about 30 degrees Celsius. Enjoy your Punta Cana golf vacation during sunny days at our Punta Cana property Cueva. 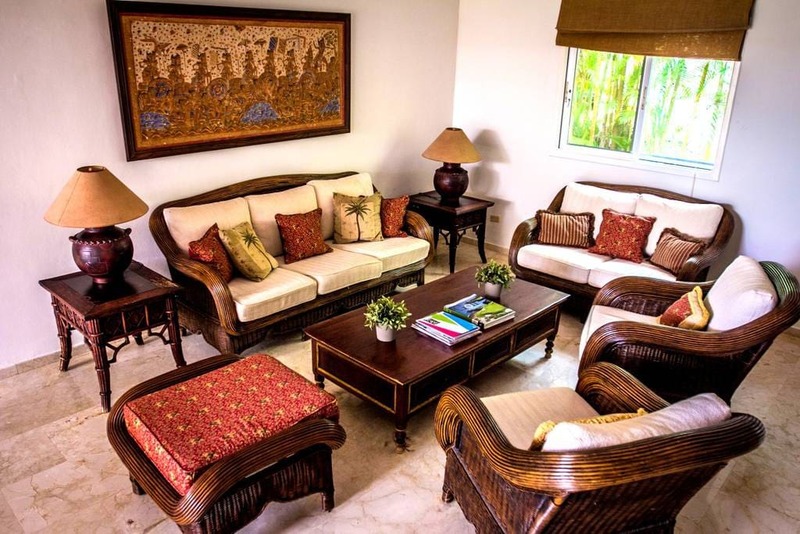 Is villa Cueva a secure vacation rental in Punta Cana? 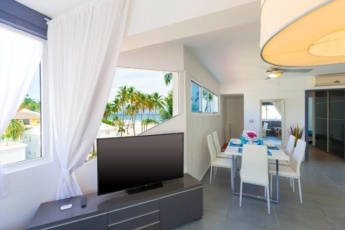 Our villa Cueva is one of Punta Cana condos for rent that are located in the most secure area in Punta Cana. Is this Punta Cana property near the beach? Our Punta Cana property is about 10 minute drive to the beach, but it has a private swimming pool. Is this property appropriate for Golf vacation? 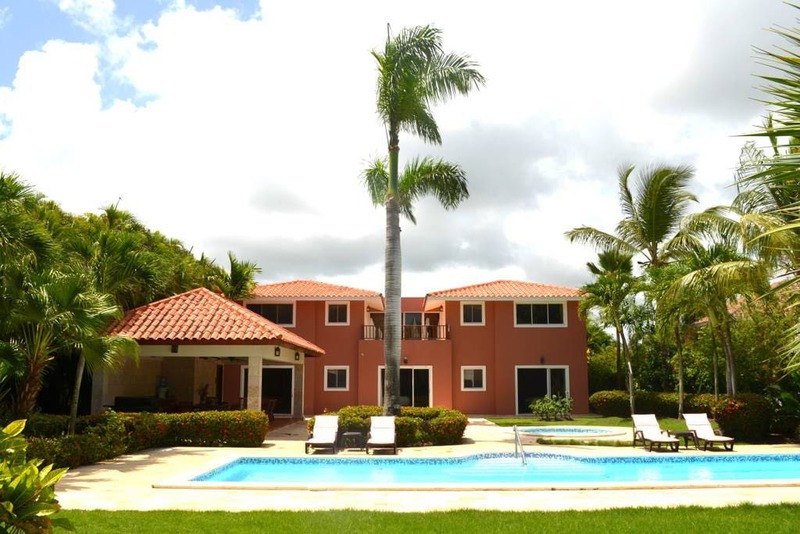 Punta Cana property Cueva is located at the famous Cocotal Golf & Country Club. It is the best place to have a golf vacation in Punta Cana. Is this vacation rental far from the Cocotal golf center? Our Punta Cana property Cueva is 5 minute walk to the Cocotal golf center in Punta Cana. 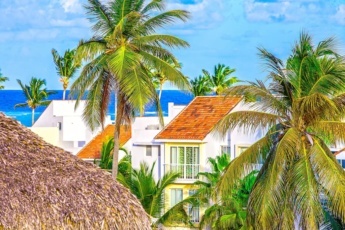 Can I book a long term rental in Punta Cana? You can book our Punta Cana property Cueva, one of the best villas in Punta Cana, for a long term vacation in Punta Cana if you would like to enjoy your golf vacation in Punta Cana. How many guests can accommodate this villa? This villa in Punta Cana is very spacious and accommodates up to 12 guests. Is this property good for a family vacation? Yes, the villa Cueva is a well-located and spacious apartment of 5 bedrooms. It's perfect for Punta Cana vacation for a family, as well as for a company of friends. Is the international airport far from this property? Our Punta Cana vacation rental, one of the best villas in Punta Cana, villa Cueva is 20 minute drive from the international airport Punta Cana. What is Punta Cana time zone? The local time zone is Eastern Caribbean Time (GMT -0400). What is Cocotal Golf & Country Club? Cocotal Golf & Country Club is a gated community located in Bávaro/ Punta Cana, Dominican Republic, It is famous for its golf opportunities and includes a 27-hole golf course. Enjoy your Punta Cana vacation at our Punta Cana villa Cueva, located at Cocotal Golf & Country Club. Book it with a direct booking Punta Cana without any commission fee on our website.